In the recent past, FWF introduces new Labour Minute Calculator for Bangladesh. The Calculator enables suppliers and buyers to determine the cost of one minute of labour in a factory. Bangladesh recently approved a 51 percent increase (for Grade 7) in the statutory minimum wage. With the higher cost of labour comes the responsibility for brands to revisit their pricing levels. The Labour Minute Calculator enables suppliers and buyers to determine the cost of one minute of labour in a factory and makes components such as bonuses and insurance visible. I came to know about this labour minute calculator from Keerthi Abe of SewEasy when I met him in the last week, in Colombo. After knowing about the new online cost calculator (on Excel Template), I downloaded the tool and checked it. I found it a good and useful tool for the garment suppliers and garment buyers. Though this labour minute costing tool is designed for Bangladesh garment factories, other counties can also refer to this tool for calculating labour minute costing. Students, industrial engineers, production managers and factory owners can refer this tool to learn the standard method of calculating labour minute cost. The how-to-use guide is provided in a separate page of the Excel file. The brief about this online tool as it is explained by Fair Wear Foundation (FWF). - Labour related Employer on-cost: Maternity leave benefits, Group insurance, provident fund, and any kind of additional bonus. These items will vary from factory to factory and the tool enables manufacturers to insert their actual labour cost elements." Dividing the total monthly labour cost for one worker by the total monthly capacity minutes for one worker would establish the price of one minute of labour. - Overtime hours: 12 hours per week, which comes down to 52 hours p/m or 3,120 minutes per month. Please note that the tool allows to use of actual overtime hours. In addition, it should be noted that one minute of Direct Labour i.e. one minute of sewing time requires Indirect Labour support e.g. quality control, maintenance, supervision etc. Therefore the Indirect labour time needs to be factored in by establishing the factory´s ratio of Direct- to Indirect Labour. This tool should allow suppliers and buyers to agree on the additional labour cost for a garment item caused by any wage increase. Based on this, appropriate measures could be taken for covering these extra costs going forward. 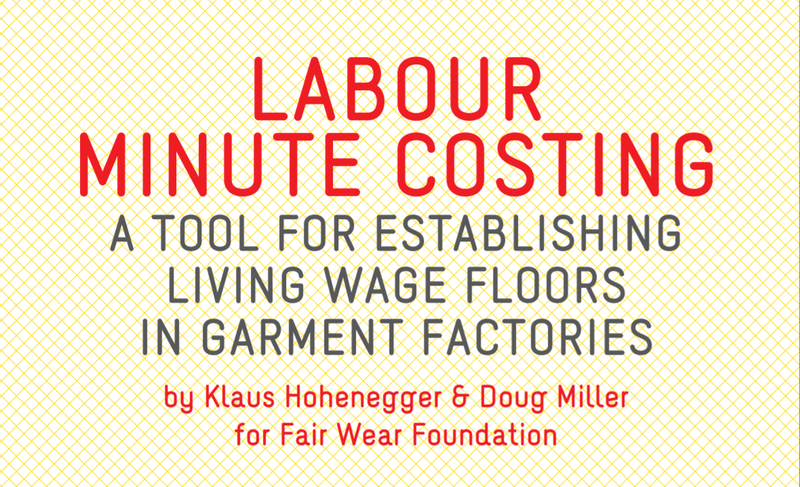 Note: The Labour Minute Tool is hosted by www.fairwear.org. If you see the download link is not working, then visit www.fairwear.org for details and latest updates. A useful tool, excel template for labour minute costing for garment manufacturing industry. Learn garment costing method by reading and using this tool.